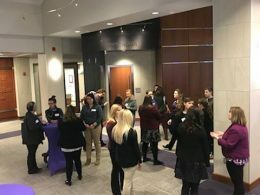 K-State ACT recently hosted a successful networking event for AGCOM students, alumni, and industry professionals. Despite the unideal weather on February 6, there were over 20 people in attendance at the event held in the Berney Family Welcome Center. At the event, there were five industry professionals representing KSU Department of Animal Science, Kansas Wheat, K-State Research and Extension, Kansas Soybean Commission, and Kansas Farm Bureau. Students mingle with alumni and other industry professionals at the Berney Family Welcome Center. An important aspect of this event was for students to improve their networking skills. The professionals first introduced themselves and then provided a networking tip that they use regularly.